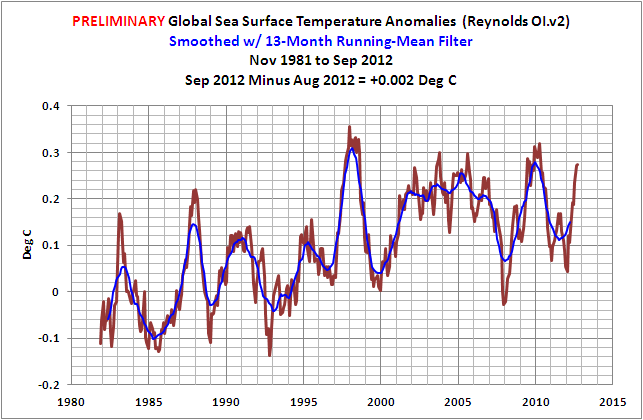 Tisdale's September 2012 Sea Surface Temperature Anomaly Update | Watts Up With That? 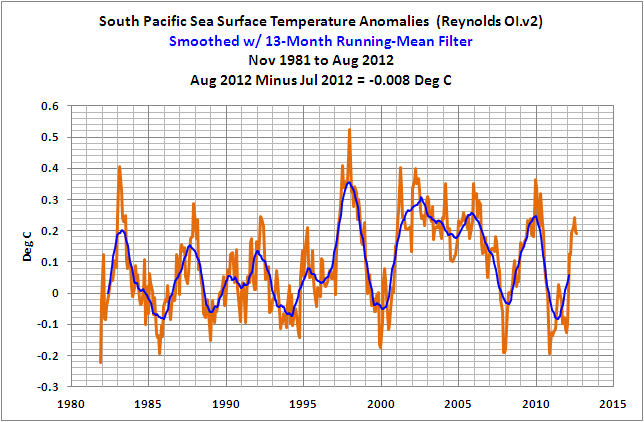 The September 2012 Reynolds OI.v2 Sea Surface Temperature (SST) data through the NOAA NOMADS website won’t be official until Monday, September 8th. Refer to the schedule on the NOAA Optimum Interpolation Sea Surface Temperature Analysis Frequently Asked Questions webpage. The following are the preliminary Global and NINO3.4 SST anomalies for September 2012 that the NOMADS website prepares based on incomplete data for the month. I’ve also included the weekly data through the week centered on September 26, 2012, but I’ve shortened the span of the weekly data, starting it in January 2004, so that the variations can be seen. The sea surface temperatures of an area in the eastern equatorial Pacific (5S-5N, 170W-120W), known as the NINO3.4 region, are a commonly used reference for the strength, frequency and duration of El Niño and La Niña events. Weekly NINO3.4 region sea surface temperature anomalies for the week centered on September 26, 2012 are well below the 0.5 deg C threshold of an “official” El Niño. They’re at +0.27 deg C.
Weekly Global sea surface temperature anomalies have been cooling for the past 5 weeks. They are presently at +0.27 deg C. Nope. That’s not a typo. 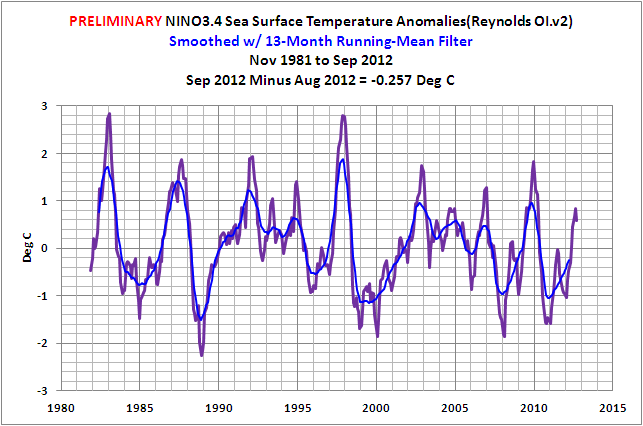 Global and NINO3.4 sea surface temperature anomalies are about the same, based on NOAA’s climatology, which uses the base years of 1971-2000. 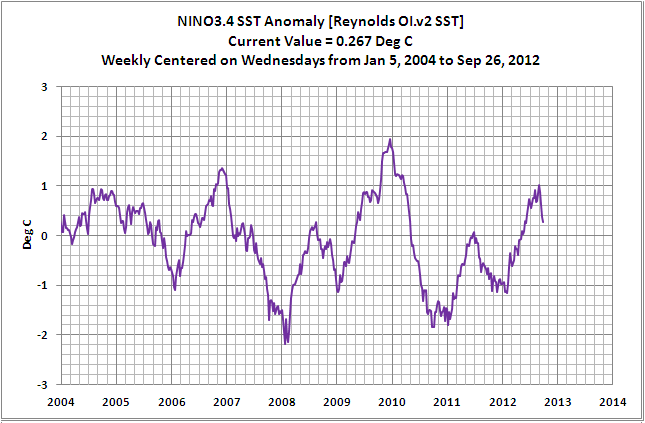 Based on the preliminary data, September 2012 NINO3.4 SST anomalies are at +0.59 deg C still above the +0.5 deg C threshold of “official” El Niño conditions. They’ve cooled (about -0.26 deg C) based on the preliminary data. Refer also to the weekly data, which continues to show cooling in the NINO3.4 region. The preliminary global SST anomalies were basically flat, having warmed only 0.002 deg C. They’re presently at +0.273 deg C.
The weekly NINO3.4 SST anomalies for 2012 are compared to those of the El Niño events since 1982 that started from La Niña conditions. The early cooling this year appears odd, but looking at the monthly data above, there have been early demises in the past. Looking at the evolution of all El Niño events since November 1981, the happenings in 2012 are beginning to look out of place. Will this year’s event turn into a non-Niño, aka La Nada? INTERESTED IN LEARNING MORE ABOUT THE EL NIÑO AND LA NIÑA? Why should you be interested? Satellite-era sea surface temperature records indicate El Niño and La Niña events are responsible for the warming of global sea surface temperature anomalies over the past 30 years, not manmade greenhouse gases. I have been publishing blog posts for the past 3 ½ years that illustrate that fact. Who Turned on the Heat? was introduced in the blog post Everything You Every Wanted to Know about El Niño and La Niña… …Well Just about Everything. The Free Preview includes the Table of Contents; the Introduction; the beginning of Section 1, with the cartoon-like illustrations; the discussion About the Cover; and the Closing. Please buy a copy. (Paypal or Credit/Debit Card). It’s only US$8.00. To keep it inexpensive, I still have no plans to publish a Kindle edition. Interesting post as usual. Thanks. Thanks Bob for your update. In the first line, “website won’t be official until Monday, September 8th., I assume you meant October 8th. “La Nada”.. Cute, I got a good laugh on that one. I’m particularly interested in what’s happening to the Bering Sea SSTs as it seems they are cooling substantially, which could lead to another record ice extent in the region this winter. If we enter into another La Nina next year, I worry that US farmers in the Southern States will face another year of below average rain, which would put further strain on already skyrocketing food prices. Looks like it’s cooling down. WUWT? The oceans are looking rather quiet, nothing extraordinary going on out there from the looks of this. Thank you Mr. Tisdale. Your updates are much appreciated. Interesting! 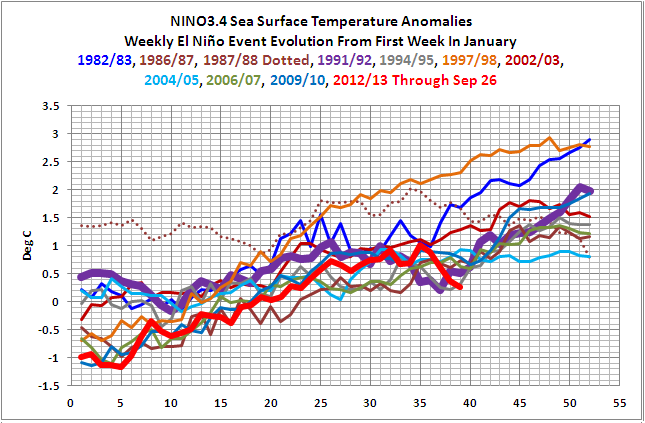 1991-92 and 1994-95 appear to be the only ones that look reasonably similar that went on to full El Nino. Do you have any records/ graphs of previous “La Nadas” ? Imagine. It is getting cooler? Isn’t that what I have been saying, looking at my graphs for max. temps? it is going to get cooler still. Until around 2039, I think. I find it interesting that, of the El Niños to follow a La Niña since 1982, this is the first one to drop below the official El Niño threshold after achieving El Niño status. This is probably arbitrary and meaningless, but I find it interesting nonetheless. Mr. Tisdale, I respectfully request that you produce a Kindle version of this paper. I purchase Kindle books as well as check e-books out of the library. I cannot remember the last time that purchased hardcopy materials although I do check them out at the Library. Just “eye-balling” the last two graphs, I would expect this year to end in a weak El Nino. These two graphs tend to consistently rise from week 40 on, as this period reflects the transition over the Equator (Southward Equinox). 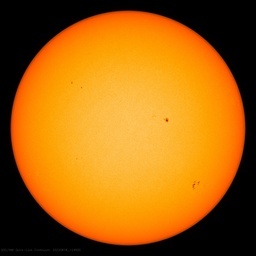 But, then the Sun, last I checked, is still in reduced output mode…. I’m reminded of the question, just how big a part might Pacific SST play in influencing the NA regime. As far as I’ve looked, across the record, there’s been both NA warming and cooling. It figures. Thanks to Ant and Bob’s elucidation of this. The NOAA graphic shows very warm anomalies in the Arctic and very cold anomalies around Antarctica. I suspect the Arctic SSTs and perhaps both are largely artifacts of how they adjust for decreased/increased sea ice. Since they can’t actually measure SSTs under ice. If the cooling around Antarctica is real then further increases in sea ice look likely. This ENSO episode is hard to pick because the ocean atmosphere coupling is unusual. SSTs have indicated El Nino conditions for a few months now, but the SOI isn’t playing ball. This is because of the unusually cooler than normal waters around Papua New Guinea, Indonesia and the Northern coast of Australia causing higher than usual air pressure for this time of year. This pressure is creating WESTERLIES in the Western Pacific instead of the expected Easterly trade winds. Once the waters in the Western Pacific warm up (probably by the end of the year) the SOI will rise, cool waters of the Eastern Pacific will start migrating west, the Nino 3.4 will drop to about -1 by the middle of January, and we’ll have a mild to moderate La Nina until after Easter 2013. 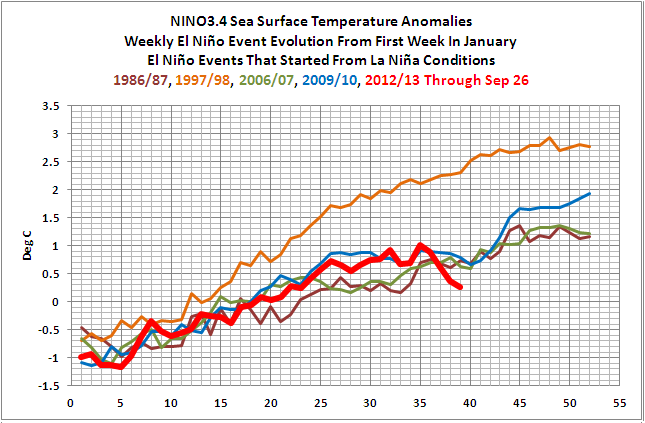 I give El Nino no chance at least until the middle of July 2013. Robin Kool, Steve Keohane and Owen in Ga, thanks. You are, of course, correct. It should have been October 8th. I’ve fixed the cross post at my blog. It must’ve been wishful thinking on my part. I’m not looking forward to winter. And that’s not the dataset presented in the graphs. 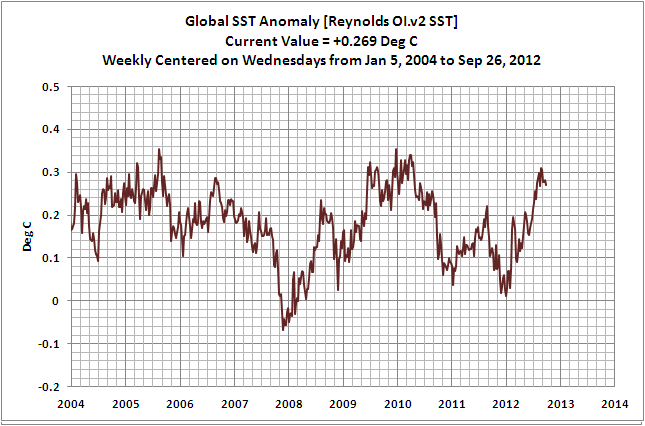 The Reynolds OI.v2 SST data uses both nighttime and daytime SST measurements and as they explain, “The AVHRR instrument has three infrared (IR) channels. Due to noise from reflected sunlight (sun glint), only two channels can be used during the day. However, at night the three IR channels are used because the residual noise is lower.” The OI.v2 data accounts for the glair problem and samples SST anomalies over the full course of the day. Maybe it should be called La Ninguna…. Excellent article and I would like to buy a copy of your book BUT it says I can pay by paypal or credit card and when you choose credit card it directs you to create a paypal account. This is bad enough, but just because I happen to be in France doesn’t mean I want to wade through all the details in French. I’ve been caught out before going through the entire rigmarole of setting up an account for whatever (saying I was in England – to get the instructions in English) only to find that the company would not send me stuff in a country different from the country of my account. Suggestions please. I’m trying to keep the price down. A Kindle edition would double the price due to the file size of the book in Kindle format. That’s caused by the number of color illustrations. The book is also not available in hardcopy. It’s only available in pdf form. If sales increase to the point where I have trouble keeping up with demand, I’ll publish it in Kindle format. But I don’t see that happening anytime soon. You can skip the part where it asks you to open a PayPal account. I did when I tested to make sure the download worked. 1. 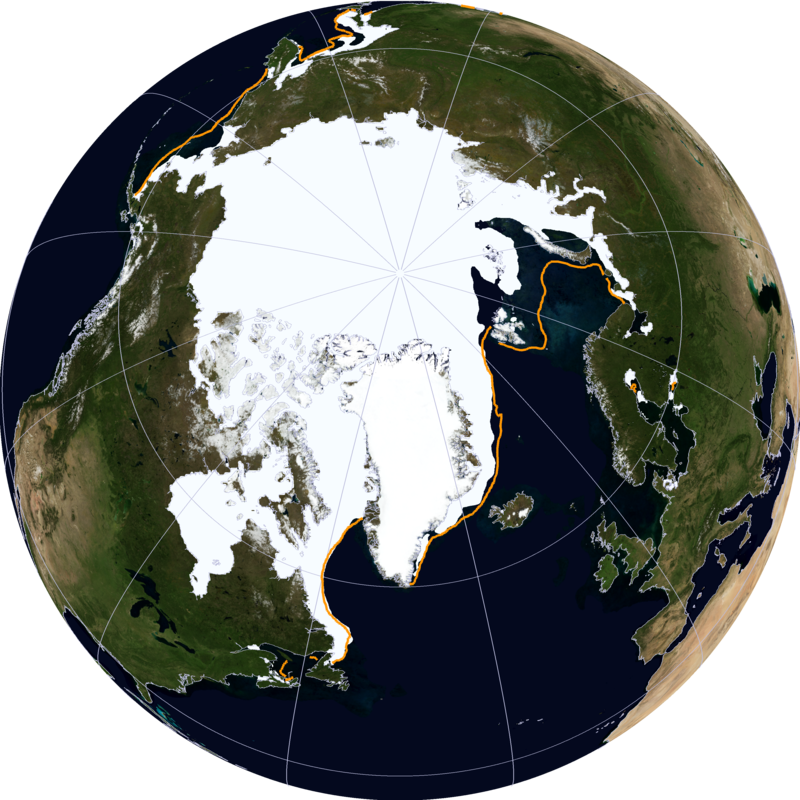 What is the cooling effect of the recent seasonal Arctic ice melt on the great ocean conveyor belt … is it cooling the Pacific? 2. When ice reforms in the Arctic it will have a higher salinity than the multi year ice it is replacing … won’t the cold dense brine being released from this new ice cool the deeper “warm” water that is know to exist in the Arctic? Do you want fries with that ?? “The AVHRR instrument has three infrared (IR) channels. Due to noise from reflected sunlight (sun glint), only two channels can be used during the day. However, at night the three IR channels are used because the residual noise is lower.” The OI.v2 data accounts for the glair problem and samples SST anomalies over the full course of the day. The great ocean conveyor belt is thought to “cycle waters” over a time period that’s somewhere in the range of 1000 to 1500 years, if memory serves. So any waters subducted in the North Atlantic recently aren’t going to be upwelled in the Pacific for a while. Do you a have a reference for that? We have nearly reached the Sun cycle peak. The next ten years will be of lower Sun output. I predict no El Niño for the near future ( or extremely mild). We will get to watch the Sun affecting weather! Bob … I don’t have reference for it … but its logical that the ice melt water will mix somewhat with higher salinity water below it … especially with wind mixing. There must be salinity data for open surface waters kicking around! Can an El Nino develop with this little warmth down there? Did it look similar in previous episodes? could this lead to an ‘El Nino Modoki’ scenario at the end of this year/beginning of the next, similar to 2002-03 and 1977-78? The current NINO 3.4 numbers would have to stay around this level to fit the ‘Modoki’ criteria, would they not? I only ask because the two greatest droughts of the past 40 years in my part of New Zealand happened under El Nino Modoki conditions in ’78 & ’03. Most El Nino events are El Nino Modoki. There are few East Pacific El Nino events. This one started off looking like it might be an East Pacific El Nino, but the sea surface temperatures in the eastern equatorial Pacific dropped quickly while the waters warmed toward the central portion. 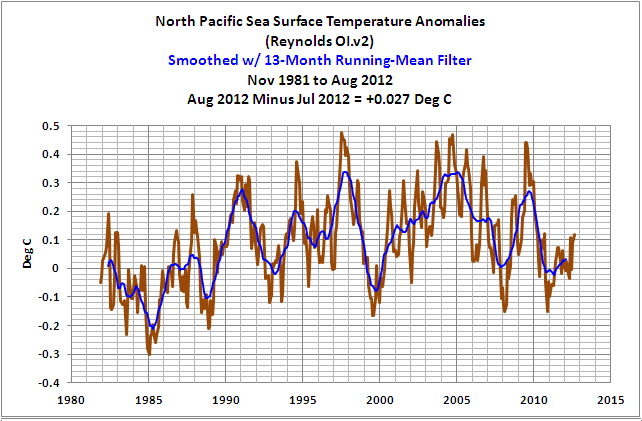 Over the past 5 weeks or so, NINO3.4 sea surface temperatures have dropped also. To answer your second question, if these conditions remained for the rest of the year, it would not be considered an El Nino, so east versus central (Modoki) wouldn’t even enter the picture. This is the first time (that I can recall) during the evolution of an El Nino, where El Nino conditions were reached, and where subsurface temperatures then started to show negative anomalies. It’s not looking like the typical evolution of a medium strength El Nino. Jon: Thanks for the link. Bob, I’m not sure what point you were trying to make. My point was, the NOAA graphic above shows strong warming for areas of the Arctic Ocean, which were ice covered for at least part of the climatology period from which the anomaly is determined (see link below). As they cannot measure SSTs under ice, they must use some other method to calculate the anomaly (which I termed an adjustment). Showing strong warming for these areas is questionable to say the least, because they don’t know what the SST was for much of the past. Apparently, I was unclear about the point you were trying to make. Thank you for your answers. Am curious to see how this evolves. I think a couple of month ago, I have not seen a model to forecast this downturn, and even now all of them are forecasting an El Nino. Hey, climate is interesting, I sympathise with Caleb.